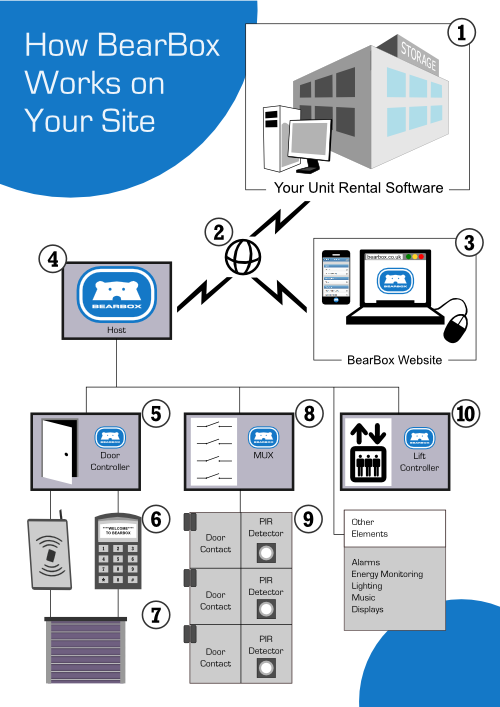 If you have a BearBox integrated access and intruder alarm system, you can fine-tune your alarm preferences so that as your staff or customers go around the site, the alarm system will be automatically disabled at various checkpoints along the way. 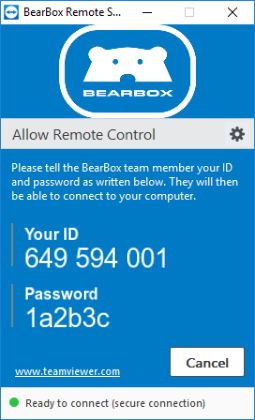 If your BearBox access control is not linked to an alarm system these settings won't work. Go to Site Setup -> Alarm Setup. Here you will see a complete list of settings that you can change. For any of these settings you can see a description of what it does by hovering your mouse pointer over the setting text. In this video I'm going to cover the main alarm settings, so these are settings that mostly affect customers. For staff alarm settings i.e. alarm settings for regular staff, cleaners and security guards, see the next video. Some of these settings might not apply to your site, so I'm going to cover the most important settings first. As your customer goes through your site, she will trigger a number of different timers. When she successfully enters her pin at the gate, this will disable the site's intruder alarm system for a set period of time. You can change this time period here with the Entry Pin Alarm Disable Timer. So we're giving our customer 20 minutes, which should be plenty of time for someone to reach their unit. If they don't reach their unit within 20 minutes, they will be automatically logged out, and if there is nobody else on site, then the alarm system will be reset. This means that now if they then get picked up by the alarm system, the alarm will sound. The next disable timer starts when your customer actually opens her unit – so when the unit door opens up, the alarms are disabled again for a period of time. By default this is an hour, but you can change it with the Unit Open Alarm Disable Timer setting. After this time, they will be logged out and the intruder alarm will reset, so again if they are the last person on site, the alarm will be automatically set and when they trigger it, it will go off. This will work the same way whether you have passive infra red detectors (PIRs) on your units or whether you have door contacts. Essentially the door contact will be set to either open or closed and the PIR will act in the same way – it will watch for activity and when it sees your customer in her unit, it will assume that the unit is opened. When activity stops for a period of time, the PIR will read the unit as closed and your customer will be transferred to the next countdown. Once the customer closes her unit, the Unit Closed Alarm Disable Timer kicks in. This is the length of time she has to get to the exit keypad having closed the unit so in this case it should also be 20 minutes – this being the time we're giving her to get from the entrance to the unit in the first place. Now if she wants to go back to her unit – she's forgotten to take something out of it – then she can do so. When she opens the unit again, the Unit Open Alarm Disable Timer will activate again, so she'll be back to having an hour to get things out of her unit. Closing the door again reduces her time allowance – she'll have 20 minutes again to get to the exit. The final timer you can set is the Exit Pin Alarm Disable Timer. Once the customer has entered her pin on the exit keypad the alarm is disabled for The stated time period. It should be kept short because in most cases this is only the length of time it takes for the customer to drive through a gate or go through a door. Once this time expires, the security system will reset so if anyone chose this moment to sneak in they would be picked up as usual by the security system. The Access door left-open time is only relevant if you have a monitored access door on your site. Altering this number means you can set how many minutes that door can stay open before you see a message on your log saying 'door left open'. This doesn't trigger an alarm or an email – just a log message that will show up on the flash plan. Unit left-open timeout controls how long a unit door can be left open before you see log message.